Add Internet and Homelife to Contour TV. You can protect, monitor and control your home from anywhere while also accessing 140+ unique TV channels! 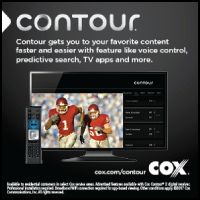 Enjoy the best live content with Contour TV: voice remote, 100 Mbps Internet, and HomeLife all starting at $99.99/mo. for 12 months. And The Employee Network members receive up to $100 bill credit plus “FREE install with qualifying bundle” for any new Cox service.